How To Use Google Drive In School is a three hour interactive course for educators who want to learn how to use Google Drive (Google Docs, Presentations, Forms, Spreadsheets). This course covers everything from the basics of document creation to using scripts to automate workflow in Google Drive. 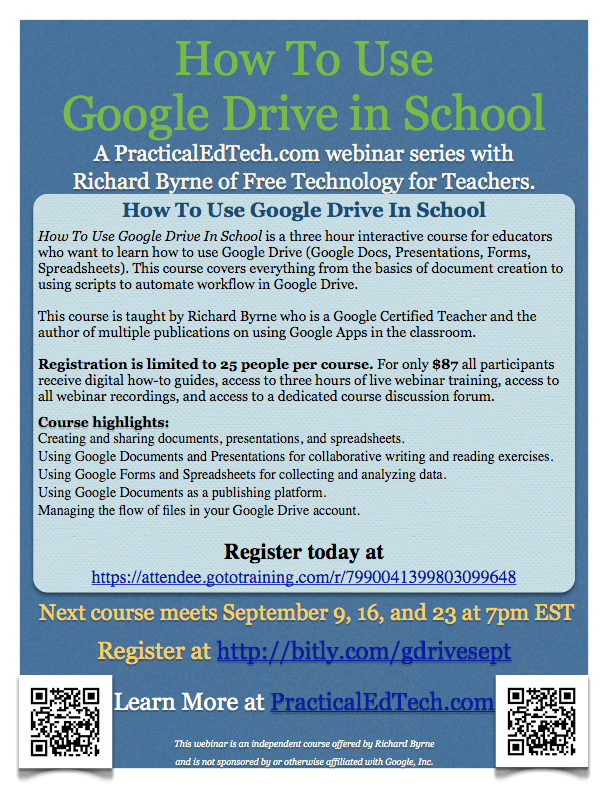 This course is taught by Richard Byrne who is a Google Certified Teacher and the author of multiple publications on using Google Apps in the classroom. Registration is limited to 25 people per course. For only $87 all participants receive digital how-to guides, access to three hours of live webinar training, access to all webinar recordings, and access to a dedicated course discussion forum. The cost of this course is $87.00 USD. The next section is scheduled to meet on September 9, 16, 23 at 7pm EST. Registration is limited to 25 seats per section. Click here to register today! *Creating and sharing documents, presentations, and spreadsheets. *Using Google Documents and Presentations for collaborative writing and reading exercises. *Using Google Forms and Spreadsheets for collecting and analyzing data. *Using Google Documents as a publishing platform. *Managing the flow of files in your Google Drive. Registration is limited to 25 students per course. *Are new to using Google Drive/ Documents. *Have previously used Google Drive/ Documents but would like a refresher course. *Would like to learn how Google Drive/ Documents can be used to help their students meet ELA Common Core Standards.